These Pyrex Bowls Are Being Used Constantly! First let me say that I can’t believe this 8-piece Pyrex Bowl Set With Lids is still at Amazon. This is an incredible price. I now have two sets of these bowls in my kitchen, and I can’t remember how I ever lived without them. Take advantage of this 46% discount. 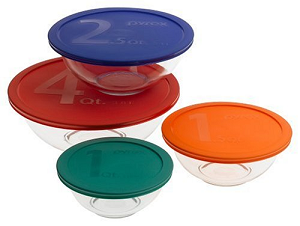 You will love these bowls with their handy lids! I love that I can see exactly what I have in these bowls. I find these are great to store prepped fruits and veggies to pull out and go with our meals or for snacks. In the above picture, you can see that we have a bowl full of grapes, one of sweet peppers, one with sliced strawberries, and one with Chocolate Whipped Cream. These bowls are great for pasta salads, potato salads, and tossed salads. Of course, they are also great for mixing up muffins and breads. In fact, last night I stirred together all the dry ingredients I needed for our breakfast muffins, put on the lid, and went to bed. This morning, all I had to do was add liquid ingredients and bake the muffins. So handy! I’m not sure how much longer this , but I really want to encourage you to look into these. I use them constantly at my house, from prep to serve. They are awesome! That is a great price. I just got back from Target where I just bought the exact same bowl set for $22.99. Yes, I’ll definitely do that. Thank you so very much for the heads up. You saved me $10.00 Laura! My SIL gave me a set almost like these for Christmas. I use them all the time and love them! 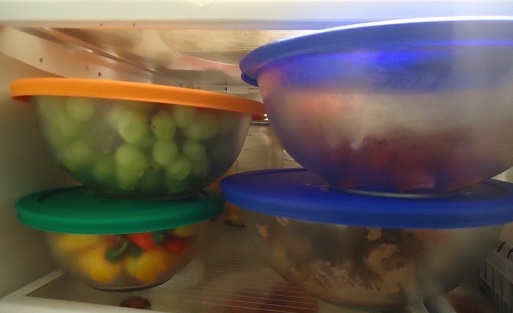 I love that I can use them for a mixing bowl and because of the lids, they’re great for storing too! I bought an extra set a few weeks ago since I love them so much and couldn’t pass up the deal. I’m hanging on to them to gift them to someone I feel will enjoy them. Glad you’re loving yours as much as I am! Just a plug for Amazon’s customer service: I recieved the bowls with a little crack in the side of the one with the orange lid. They replaced the whole set and I threw that one bowl away. Super!